Comments On: "Precisely how spacetime geometry is "quantized""
In 1950 A. Einstein theorizes the existence of energy path dictates... with an inherent spatial quantum geometry that can be represented by a volumetric coordinate system. A spatial geometry which will "require painstaking efforts and probably a new mathematics"... and he gives essential criteria for an energy field geometry which would resolve incongruence's and satisfy his observations. In 1982 R. Feynman theorizes... a computer that operates on quantum principles... which could act as a "Universal Quantum Simulator"... to simulate behavior of any quantum system by verifying the entities of the system follow the path dictates of a specified lattice coordinate geometry and associated coordinate transform rules. There is considerable difference between theory and a precise coordinate geometry which visually represents the mathematics underlying the theory... i.e. the theoretician may or may not have successfully developed the mathematics that yields a lattice that supports the theory. A cube has six facets... (none of which are "folded" facets)... and it is the base volumetric unit of quantization of the Cartesian coordinate system. Both Einstein and Feynman agreed that a Cartesian coordinate lattice does not support computations for the concept of gravitational collapse... i.e. g=0... not even in conjunction with a Radian coordinate system of any dimension. But how would one recognize a Universal Quantum Lattice?... what would it look like?? In that our observations of physical phenomena demand infinite scalability and integratability of all system event analysis... the necessity for a unified quantization unit is fairly straight forward. The Cartesian coordinate system is comprised of a uniform unit... the cube... but it does not support the concept of g=0. It is easy to equate the physics of g=0 to a necessity for a spherical lattice... but a "true" sphere can not be uniformly quantized with a single unit of volume... and many mathematicians... like Univ. of Calif. Redlands Math Dept. John Baez... have experimented with other forms of symmetrical closure. In 1994... Baez's analysis of tetrahedrons yielded "a geometrical explanation of the otherwise puzzling fact that the quantum tetrahedron has more degrees of freedom in 3 dimensions than in 4 dimensions"... but he remained uncertain that the a Universal Quantum Lattice "will find experimental confirmation". touches are put on the mathematical rigor, we don't know if the theory really exists!" be quite such a big deal. But experimental verification will probably take a long time." A tetrahedron does not support tensor symmetry... i.e. an energy entity can not travel as a base unit packet... which is required to support our observations of light as both a wave and particle phenomena. For a unit of volume to exhibit tensile symmetry... it must have continuous closure. A cube, tetrahedron, pyramid, etc.... do not have continuous closure. Continuous closure in a unit of volume... is the ability to traverse... all lines comprising the unit of quantization... without traveling along the same line more than once. This insures that only the info values at a lattice intersection... not the algorithmic structure of the lattice itself... dictate path decisions. This is necessary to support our observations that an entity will travel without variance in path... unless acted upon (at a lattice intersection) by another energy entity. The bit info values of the vertices can define an energy entity... even at subplanck scale. The requirement for a Singularity is simplified by a clear definition of the geometry of a singularity. At any given scale... a singularity encapsulates a single vertex... (the singularity origin)... which is common to all base unit's of quantization... that comprise it's geometric form... in the specified lattice unit packing algorithm. A Cartesian coordinate system requires eight base volume units... i.e. 8 cubes... to uniformly quantize a singularity... but the Cartesian singularity does not exhibit continuous closure... and therefore does not support tensile symmetry. Inherent in Einstein and Feynman's theories...a valid singularity of a quantum system must also exhibit continuous closure... and consequently... tensor symmetry. As recent as January 2009... Derek Wise of the University of Calif. Davis Math Dept.... is quoted as having said "Precisely how spacetime geometry is "quantized" is contentious"... i.e. there is no agreement on a model that maps vision and theory to a coordinate geometry. At high quantization resolutions the "jaggies" in the perceived curvature of a sphere disappear... and although not a sphere in the classical sense... a dodecahedron is a twelve sided volume of symmetrical closure. A "folded" facet quadhedron... uniformly quantizes a dodecahedron. Six "folded" facet quadhedrons comprise a dodecahedron singularity that supports the mathematics of tensor symmetry... i.e. the singularity also exhibits continuous closure. Each "folded" facet quadhedron can be uniformly quantized by folded facet quadhedrons and maintain the integrity of the dodecahedron... which provides infinite scalability and integratability... in collapse or expansion scenarios. 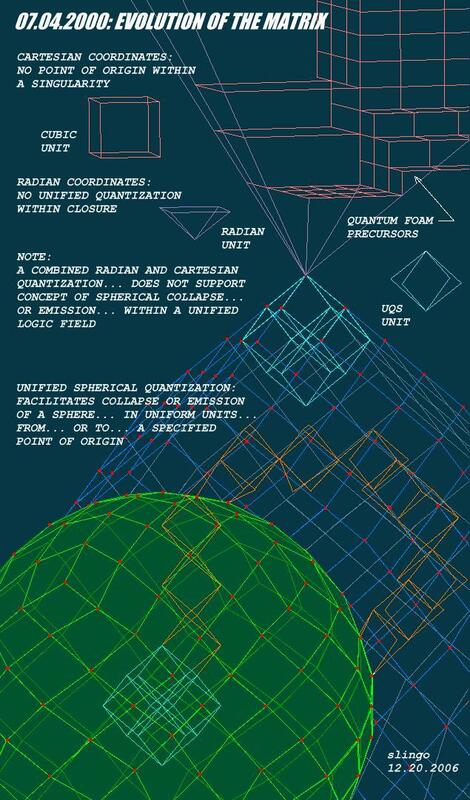 The folded facet quadhedron... is the base volume unit of the Unified Spherical Quantization (UQS) coordinate geometry. Note: an "unfolded" facet quadhedron is essential two pyramids... and does not exhibit continuous closure. In 2004...research and development physicist like E. Manousakis at Dept. Physics Florida State Univ... utilized the power of lattice geometry to deal with Many Fermions... but without a verified universal quantum geometry... they developed dedicated lattices... designed to specifically solve coordinate transforms for Fermions' spin in a given quantum event. Although useful as an "analog device to extract physics from spin foam models"... the consequences of utilizing a Dedicated Quantum Simulator... that may or may not support Einstein and Feynman's criteria for a universal quantum field model... may be a loss of integratability in the event of a valid universal quantum geometry... and will result in tears and holes in our information model of spacetime fabric... which is a chaos scenario that Einstein and Feynman insisted we should avoid. The algorithmic structure of the UQS coordinate system provides the infinite integratability essential to a valid quantum filed model... and although theory is often difficult... if not impossible... to evaluate... a lattice is not a theory. A lattice is a volume unit quantized coordinate geometry... which can be used as a simple reentrant digital processor... i.e. a computer... for solving any computations for which it supports the theory of. Given a candidate for a valid universal quantum geometry... i.e. that satisfies the theorist criteria... it is perhaps worth prioritizing empirical evaluation of the proposed coordinate geometry... rather than continue the practice of developing Dedicated Quantum Simulators.